Research reports related to the control of bovine tuberculosis in badgers have been made public today. Defra has made public supporting data behind the successful licensing of the first tuberculosis vaccine for badgers (Badger BCG), which was licensed by the Veterinary Medicines Directorate in March this year. The studies were carried out by the Veterinary Laboratories Agency (VLA) and the Food and Environment Research Agency (Fera). The laboratory studies with captive badgers demonstrated that the vaccination of badgers by injection with BCG significantly reduces the progression, severity and excretion of Mycobacterium bovis infection. A key finding of the field study, conducted over four years in a naturally infected population of more than 800 wild badgers in Gloucestershire, was that vaccination resulted in a 74 per cent reduction in the proportion of wild badgers testing positive to the antibody blood test for TB in badgers. The blood test is not an absolute indicator of protection from disease, so the field results cannot tell us the degree of vaccine efficacy. While the findings indicate a clear effect of vaccination on badger disease, data from the laboratory and field studies do not lend themselves to giving a definitive figure for BadgerBCG vaccine efficacy. Nor do they provide information on the effect of badger vaccination in reducing TB incidence in cattle. A scientific paper summarising the results of the injectable BCG badger vaccine research has been accepted for publication by the scientific journal Proceedings of the Royal Society B (Biological Sciences) and will be published shortly. Defra is also publishing today the results of new computer modelling by the Food and Environment Research Agency (Fera), which has examined different strategies for controlling TB in badgers, including both culling and vaccination. The results of the modelling were consistent with the conclusions of the Randomised Badger Culling Trial indicating that there were both positive and negative effects of culling. The modelling shows that badger vaccination could make a positive contribution to disease control in its own right and was consistently positive when used in combination with culling in a ring vaccination strategy. a) A combined strategy of vaccination in a ring around a culling area was more successful than the cull-only strategy, which in turn was more successful than the vaccination-only strategy, both in reducing the number of TB infected badgers and cattle herd breakdowns. Ring vaccination partly mitigated the detrimental effects of culling. However, the combined strategy requires about twice as much effort than either single approach done in isolation. b) Culling of badgers should continue for at least four years to realise a clear benefit. However, low rates of land access for culling, or low culling efficiency, or the early cessation of a culling strategy was likely to lead to an overall increase in cattle herd breakdowns (whilst this is not the case for vaccination). The Veterinary Medicines Directorate (VMD) issued an authorisation for BadgerBCG vaccine on 24 March 2010. VLA is the market authorisation holder and the vaccine is manufactured by the Statens Serum Institut in Denmark. VLA is an executive agency of the Department of Environment, Food and Rural Affairs (Defra). It is a regional network of 16 veterinary laboratories including a central facility near Weybridge in Surrey. VLA provides a wide range of applied research and consultancy on livestock diseases and surveillance of new and emerging diseases for the Government and animal health industry. It is also a national and international reference laboratory for many farm animal diseases including avian influenza, bovine tuberculosis, classical swine fever and TSEs. 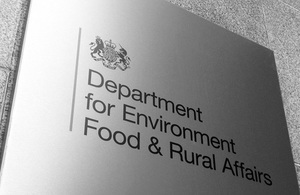 The Food and Environment Research Agency (Fera) is an executive agency of Defra. Its remit is to provide robust evidence, rigorous analysis and expert professional advice to government, international organisations and the private sector, in order to support and develop a sustainable and secure food chain, a healthy natural environment, and to protect the global community from biological and chemical risks. Fera has the largest group of wildlife management specialists in the UK. This along with extensive facilities and resources has positioned their scientists as leaders in wildlife management and disease control. Fera is responsible for the coordination of the Badger Vaccine Deployment Project. The Coalition has committed to publishing a balanced and comprehensive bovine TB eradication programme early in 2011. In preparation for that a public consultation on our proposed approach to badger control is currently underway. The consultation document is available on the Defra website and closes on 8 December.